The Musk ox was once quite widespread in Scandinavia. More than 30,000 years ago, around the last ice age, they would have been a relatively common sight – wandering across the northern regions of Norway and Sweden alongside wooly rhinoceros and mammoths. The small group in Sweden thrive today much thanks to the care from the people at Myskoxcenter in Tännäs, Härjedalen. The Muskox care for their calves. Although musk oxen are still widespread in Greenland, Alaska and parts of Canada, catching sight of one of these stunning animals in Europe is something of a challenge these days – largely due to a history of over-hunting by people. With only around 250 individual musk oxen present in the Dovrefjell region of Norway – and a mere handful in Sweden – it’s unlikely you’ll come face-to-face with one while out for a hike. They are truly Arctic animals, well-adapted to their extreme environment with a superbly insulated, long, thick coat of dark brown hair and woolly undercoat. In fact, they have the warmest wool in the world – it’s much warmer than sheep’s wool and the outer layers of hair can grow up to 70cm in length. The musk ox have an impressive coat, ten times warmer than sheep´s wool. If you do come face-to-face with a musk ox, be very careful. This is an immense, powerful creature. And although they are normally shy, and will only charge if they feel threatened, if they do decide to charge they can be very dangerous. So if you want to see a musk ox, it’s recommended that you take a tour with a specialist. Not only will your guide know the best places to see these magnificent mammals, but they will ensure that you can observe them at a safe distance that will keep you out of danger and also avoid causing undue stress to the animals. A sign of warning. The Muskox is a powerful creature, but will only charge when threatened. The Musk ox is an Arctic animal well adapted to a tough climate. It is an enigmatic prehistoric animal worth protecting. Sweden’s group of wild Muskox are found in the mountains, west of the village Tännäs in Härjedalen, Sweden. 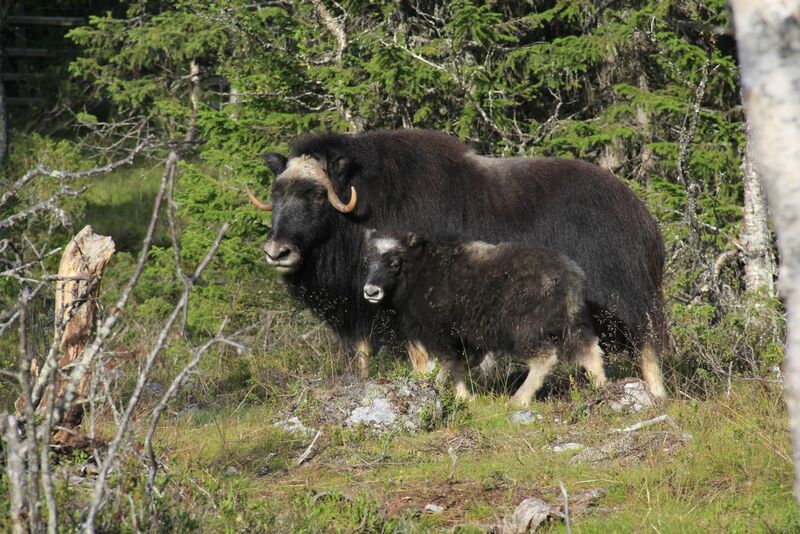 The Musk ox in Härjedalen are descendants of 5 individuals who immigrated from Dovrefjäll in Norway in 1971. During the 70’s and 80’s, the herd grew to 30-40 animals. From the late 80’s, the number has slowly decreased, due to disturbance from visitors coming too close together with other factors and today there are about 10 animals. 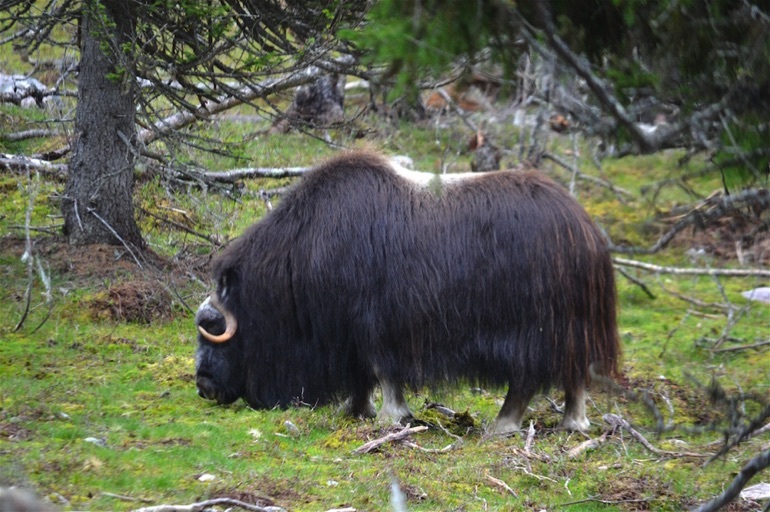 The Musk Ox (Ovibos moschatus) has a short and sturdy body with a strong shoulder. The bull weighs 300-400 kg, is 2.5 meters long and about 1.45 meters in height. The cow can weigh 200-300 kg, is 2.3 meters tall and about 1.3 meters high. The animals are well suited for an Arctic climate and do not like summer temperatures exceeding +20 ° C. The Musk Ox can handle colds down to about -50 ° C and strong wind thanks to a thick grease layer and, above all, the thick coat. The coat, which is about 10 cm thick, has two layers, one undercoat and long hairs on top that can grow up to 70 cm long. The undercoat has ten times higher thermal insulation than sheep’s wool. Both cows and bulls bear horns. The Musk Ox may seem as a mixture of a cow and a sheep, but they belong to the family of Caprine Animals and are more closely related to goats and sheep, not with cattle. Musk Ox live in groups of five to thirty animals. They do not walk much more than a few kilometres a day in winter to save energy, while they pretty much move all around the clock in summer. The most dominant female, in the flock, is the leader who determines the direction in which animals will go during the day. The Musk Ox often have body contact with each other and on their own the whole flock can look like an animal with many heads. Berry bushes and different kinds of grass are the basic foods in the winter and during the summer they eat Willow, Birch, Angelica and similar herbs growing among mountain birches. The natural enemies of the animal are besides human beings, wolves. When they are threatened, they flock around the calves to protect them in the middle of the group. The adult individuals stand around with heads and horns pointing outwards. Their top speed is 30-50 km/h. The Musk Ox is the last of the great prehistoric animals still roaming earth. The species originated in the high plateaus of Central Asia millions of years ago. During the last ice age there were Musk Ox all over Europe and North Asia. Finds of fossils show that they used to live side by side with Mammoths and wholly rhinoceros 30-64 000 years ago. When the last ice age was over and man inhabited the north the Muskox were an easy prey and the animals got extinct – due to intensive hunting. To get a really close-up view of a musk ox – in a safe and secure environment – we headed for the village of Tännäs in the Härjedalen region of Sweden. 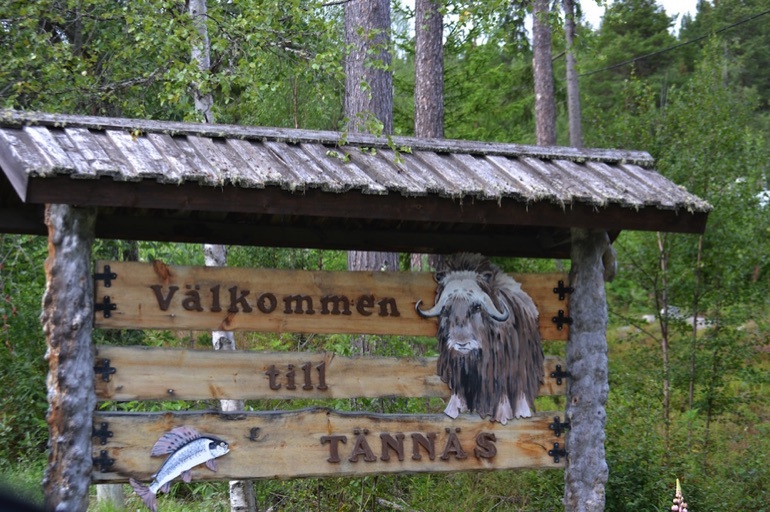 A short drive from Tännäs is the Musk Ox Centre – or Myskoxcentrum – home to a small family group of musk oxen that live in a huge, natural enclosure. The centre’s breeding facility was opened in June 2010. Alongside breeding and research, the centre aims to spread knowledge and understanding of the musk ox and its situation in Scandinavia. Their forehead is immense - much needed when the Musk ox crash into each other to decide who is the greatest. Heavy weight champions decide on who is the boss. Our guide, Hielke Chaudron, has worked for the Musk Ox Centre since 2009 and has an extensive knowledge about these fascinating creatures. We started our tour by climbing up a tall wooden viewing tower. This looks west across a vast, unspoilt landscape that stretches all the way to the Norwegian border. It’s within this mountainous area that Sweden’s tiny population of wild musk oxen live, Hielke told us. These animals are descendants of five individuals from Dovrefjell in Norway, who wandered across the border in 1971. To begin with, this little group of animals thrived – and by the 1980s there were 30 musk oxen living in Sweden. But then their numbers declined, and now there are only around 11 remaining on the Swedish side of the border. One cause for this decline is people. Eager to see the spectacular creatures in the wild, tourists took snowmobiles and helicopters to get as close to them as possible. Musk oxen can’t run fast – they are cumbersome and heavy and have short legs – so they can’t escape easily from real or perceived threat. The resulting stress causes the animals to lose weight from the fat reserves that are essential for winter survival. And if they do become frightened and run away, a pregnant cow may lose her calf. From the viewing tower we headed into the 15-hectare musk ox enclosure, through a series of secure gates that keep the animals – and visitors – safe. We climbed up a ramp onto a large platform that gave us great views across the musk oxen’s home – a natural habitat of trees, fells and rocky outcrops, much like the landscape they would inhabit in the wild. There were no musk oxen in sight. Hielke poured feed into the troughs below the viewing platform, shaking the bucket as he did so to attract their attention. Hielke Chaudron is a guide at the center since 2009. He speaks perfect ”Härjedalska” (regional dialect) though he came to Sweden from the Netherlands as late as in 2004. He is known as “the man who speaks to Muskox” and his best ever memory from working at the center is when he got to ride on the back of the bull Ullrik. He also has a strong bond to Neassa and Härje who eats out of his hand. Naessa and calf Lykke. Keep your distance! We waited, standing in anticipation, and scanning the trees to the rocky horizon. But no musk ox appeared. Hielke shook the bucket again, calling out to the animals. But there was still no sign of them. So while we waited, Hielke told us more about these magnificent creatures. Musk oxen usually live in groups of 20-30 individuals, and can live for 16-18 years. In summer they move into the lush river valleys, where they feed on grass, lichens and mosses – they spend 24 hours a day eating to build up those vital fat reserves that will keep them going through the winter. Then Hielke looked around the enclosure once more. “Can anyone see a musk ox?” he asked. We scanned the landscape again, but could see nothing. “You need to look harder!” said Hielke. We heard him before we saw him, a low, mumbling growl drifting through the trees. Then we saw the dark bulk of the eight-year old male – a 400kg mass of long, straggling fur lumbering slowly towards us. His head was crowned with distinctive, curved horns and dwarfed by his immense, powerful shoulders. The female followed a short distance behind him, her three-month-old male calf at her side. The three animals came close up to the viewing platform to feed – they were just a few metres away from us. We had an amazing view of them – the sort of experience that we could never have had in the wild. After 20 minutes or so, the family wandered slowly off – retreating into the trees and out of sight. It had been a privilege to see three musk oxen at such close quarters – and we left hoping that the work of the Musk Ox Centre and others will help to ensure a long-term, secure future for this remarkable species in Scandinavia’s wild places. Welcome to Musk Ox territory - Tännäs in Härjedalen, Sweden. How would you like to breathe the same air as a prehistoric animal being as close as a few meters from the magnificent beasts? 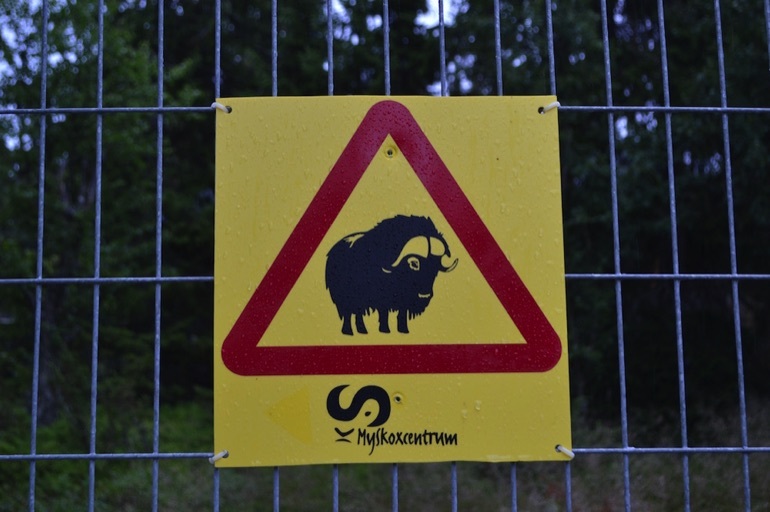 Myskoxcenter in Tännäs is a sanctuary for a few Musk ox working for a better understanding and research as well as a sustainable Musk ox herd in Sweden. At Myskoxcenter in Tännäs in Funäsfjällen, the animals are kept in their natural environment. They have plenty of space and a lot of their natural food. From the high ramp visitors can study the animals and get information from initiated guides. 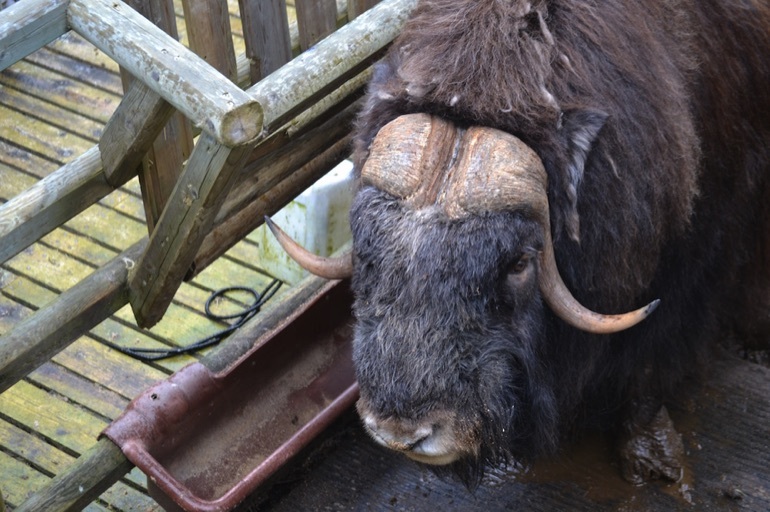 Myskoxcenter was opened in 2010 with the purpose of research for a better understanding of the Musk Ox and giving visitors the opportunity to see the Musk Ox in a more natural environment than a zoo. The ramp is built so that the animals will not be disturbed unnecessarily despite daily guided tours all year round. There are airports in Östersund and Sveg in Sweden as well as in Trondheim and Röros in Norway. To Åre Östersund Airport there is a direct flight with easyJet from London Gatwick Airport and Kastrup Copenhagen Airport, To Trondheim Airport there are many international flights to choose from. From Stockholm the train is a convenient way of getting up to the mountains, check out SJ with destination Östersund or Sveg. From the airports/train stations: a rental car is advisable or check local buses. Guided tours are to be booked at least 1 hour before the tour starts. Guided tours are 1,5 hours in length, every day of the year, starting at Härjebrygg (beer brewery), Bygatan 37 in Tännäs, Funäsfjällen. Funäsfjällen offer many places for a good meal and a comfortable bed. Don’t pass up on learning more about the Sami culture at the mountain museum, Fjällmuseet, in Funäsdalen. Why not combine with a hike in the summer or ski touring in the winter.